Blindness can be one of the most worrisome complications of diabetes. While many diabetic patients are familiar with retinopathy as a complication of diabetes, many diabetic patients are not as familiar with glaucoma. While this is not a sudden cause of blindness in diabetic patients, this condition can lead to blindness over time. Glaucoma in diabetes is like hypertension of the eye. With diabetes and glaucoma, the pressure in the eye builds up because fluid gets trapped. The increased pressure may lead to decreased blood flow to the parts of the eye that help you see, the retina and optic nerve. Damage to the retina and optic nerve lead to decreased vision and potentially blindness. This is a progressive disease, which means that without treatment it will get worse. The longer you have had diabetes the more likely you are to develop diabetes and glaucoma together. Research reported by the University of Michigan Kellogg Eye Center has shown that having high cholesterol or hyperlipidemia may lower the risk of glaucoma when you have diabetes. It is unclear whether it is the hyperlipidemia or the drugs that are used to treat hyperlipidemia, statins, that lead to the decreased risk of glaucoma. According to the American Diabetes Association, people with diabetes are 40% more likely to develop glaucoma than people who do not have diabetes. This risk of glaucoma with diabetes increases as you get older or if you have other complications of diabetes like diabetic retinopathy. How Would I Know I have Glaucoma If I Have Diabetes? Most patients with diabetes do not have symptoms of glaucoma. If your diabetes and glaucoma is beginning to lead to vision loss, you would expect to see things at the center of your eye without any differences, while things on the periphery or off to the side may be blurry or not seen as well. Glaucoma generally does not cause eye pain or redness. If you have these symptoms, blurry vision, nausea or other problems with your eyesight, call your eye professional for an appointment. Every diabetic patient needs to see an eye professional every year. 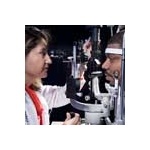 Your eye professional will screen you for glaucoma as part of your regular diabetes eye checkup. If you have an elevated eye pressure or other abnormality, you may need to see your eye professional more frequently. When you see your eye care professional they will look into the back of your eye to see if there is any damage to the retina and optic nerve. They will also use special tools to measure the pressure and determine if it is elevated. They may also test both your central and peripherla vision to see if there are any problems. Unfortunately, taking vitamins does not prevent glaucoma when you have diabetes as it does for some other eye conditions like age related macular degeneration. There are 2 other types of treatments that may lower the pressure of glaucoma when you have diabetes. The 2 treatments are laser therapy and surgery. Both of these treatments improve drainage of fluid from the eye and decrease the pressure. In general, your doctor will likely recommend surgery only after the eye drops have not successfully lowered the eye pressure when you have diabetes and glaucoma. You are at higher risk for glaucoma if you have diabetes. You need to see your eye professional every year or if you develop eye symptoms. American Diabetes Association. Eye Complications. Accessed January 14, 2013.